Last year, as we started to contemplate how we could commemorate the 25th Anniversary of the Vidyadhara, Chogyam Trungpa Rinpoche’s Parinirvana, the Sakyong told some of us who were planning the events that there was one element that was very important to him. 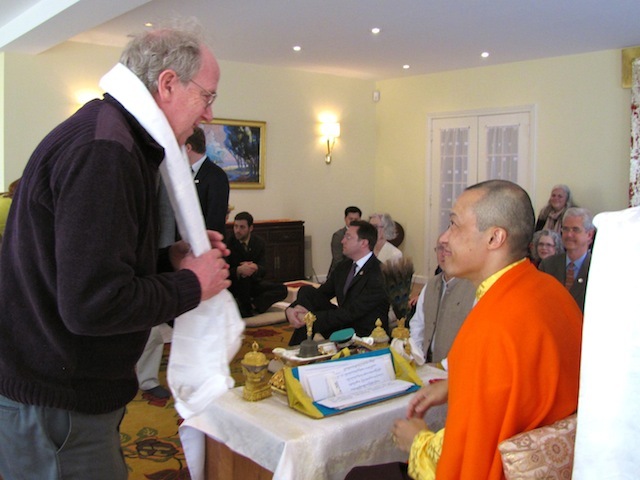 He told us that he wanted to do something special to honor and thank the Vidyadhara’s students for all that they had contributed to establishing Shambhala. We began discussing the various options for how to accomplish this gesture of thanks. Should we hold an event? Issue an award? Skywriting? (kidding!) When the idea arose to commission a special work of Shambhala art, it felt like the right direction, and the Sakyong was very happy with this idea. 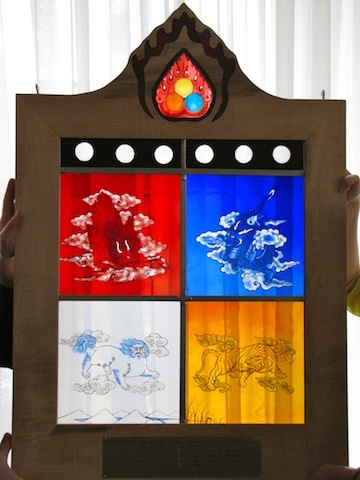 Amanda Hester, the Adjutant to the Shambhala Office of Culture and Decorum, suggested that the Sakyong could commission a stained glass piece from her father, Artist to the Kalapa Court, Randy Hester, whose beautiful pieces adorn several centers and many homes. The Sakyong chose the image of the Mukpo Family Crest for this piece, as the Mukpo clan is what unites all of us in the Shambhala community. This crest features the four dignities of Tiger (meek), Lion (perky), Garuda (outrageous) and Dragon (inscrutable). Above the four dignities is a black band with six white dots, representing the six major clans of Tibet, of which Mukpo is one. The crest is ornamented with the three jewels symbol, which represents the Buddha (or buddha nature in all of us), the Dharma (teachings) and the Sangha (community). Mr. Hester broke his hand while this piece was still a work-in-progress, so he was assisted by a Halifax sangha artist, Paul Selva. The frame for this piece was crafted in birds-eye maple by St. Margaret’s Bay sangha member, Mark Russell. The beautiful stained glass piece was officially dedicated by the Sakyong during the Sadhana of Mahamudra Abhisheka in Halifax on April 1, 2012, where it was received by the Druk Sakyong Wangmo, Lady Diana Mukpo, on behalf of the Druk Sakyong’s students. 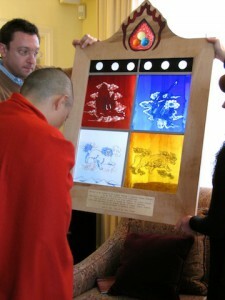 It will hang in the reception room of the Halifax Shambhala Centre so that as many students as possible can see it over the years. And the generations of Shambhala warriors. 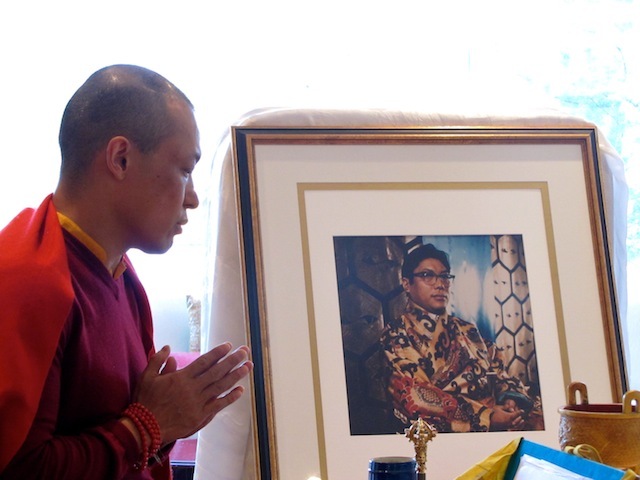 Beautiful tribute to those who have established Shambhala Centers worldwide, without whom I would have no living connection to the teachings. Much gratitude! Even before becoming formally a Buddhist I felt attracted to read one of the books I saw in my mother’s bookshelves – “Shambala – The Secret Path of the Warrior”. I am finding more about myself everyday but that book was a mark in my life. I read about Rinpoche’s life after that and it was very inspiring. 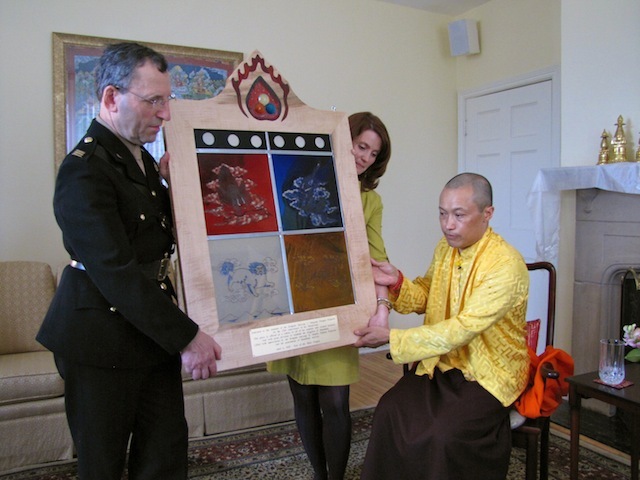 I just wanted to say that it is a beautiful commemoration, with a beautiful piece and I think that represents beautifully and gracefully the spirit of the Shambhala warrior. May all be auspicious for the enlightened activity in the world and may Shambhala community be prosperous and all its projects be fulfilled without hindrance. May it inspire many beings throughout the ages. How about a lapel pin of same design for those who were his students? He loved lapel pins. Seems fitting.